Packed with stunning pieces of artwork from the Warner Bros. archive, this book gives fans the chance to colour in the magical creatures of J.K. Rowling's wizarding world. House-elves and merpeople, Cornish pixies and dragons - the wizarding world is populated by an unforgettable cast of magical beings and extraordinary beasts. Filled with detailed illustrations inspired by the Harry Potter films, this colouring book presents the creatures of the Forbidden Forest, the Great Lake, and much more. Relive favourite scenes like Harry, Ron, and Hermione's escape from Gringotts on the back of a dragon and explore intricate creature-themed patterns in this interactive journey through the wizarding world. 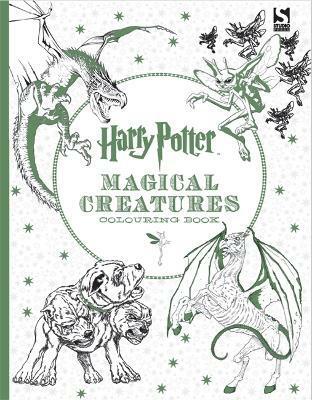 Unique and interactive, the Harry Potter Magical Creatures Colouring Book is a perfect collector's item for fans of the blockbuster saga. Harry Potter has thousands of adults grabbing their magic markers for a spell of colouring. Warner Brothers is cashing in on a grown-up crayoning craze with a book of creatures from the movies which is shooting up the charts. Warner Brothers is cashing in on a grown-up crayoning craze with a book of creatures from the movies which is shooting up the charts. -- Warren Manger * http://www.mirror.co.uk/news/uk-news/adult-colouring-book-wizards-can-7328180 * An official Harry Potter-themed version has stormed the Sunday Times bestseller list, selling 300,000 copies to date. A follow-up is out this week, based on scenes from the HP films.